Last week, Chauncey and I went on an anniversary trip to Charleston, South Carolina. It is one of our all-time favorite places. We stayed on Folly Beach (see more about that here). I’ll be sharing more details about our trip over the next several weeks, and I shot a bunch of outfits while we were there. 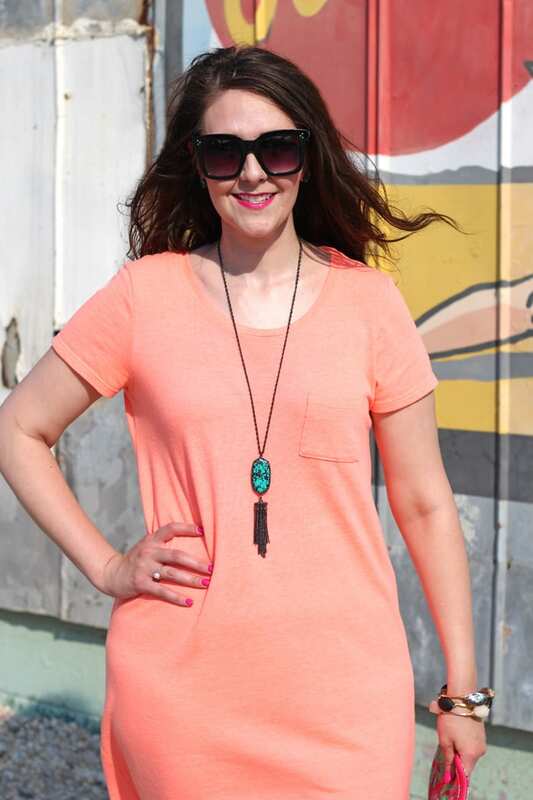 This tangerine t-shirt dress as the first one. 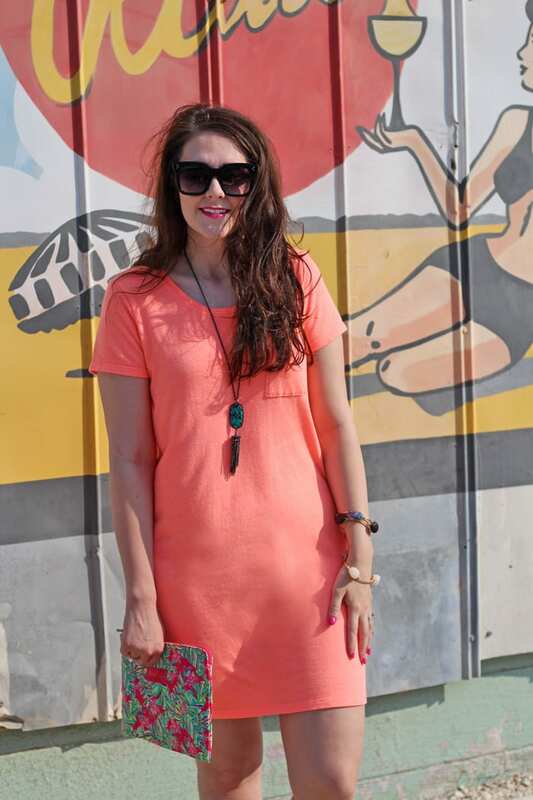 This tee dress is from the Gap Factory, and I caught it on major sale. I’m pretty sure I didn’t pay more than $10 for it. The neon color is just so happy, and the material is super soft. It’s quickly become a weekend go-to. I packed it for our trip because I knew it’d be a light and airy option. 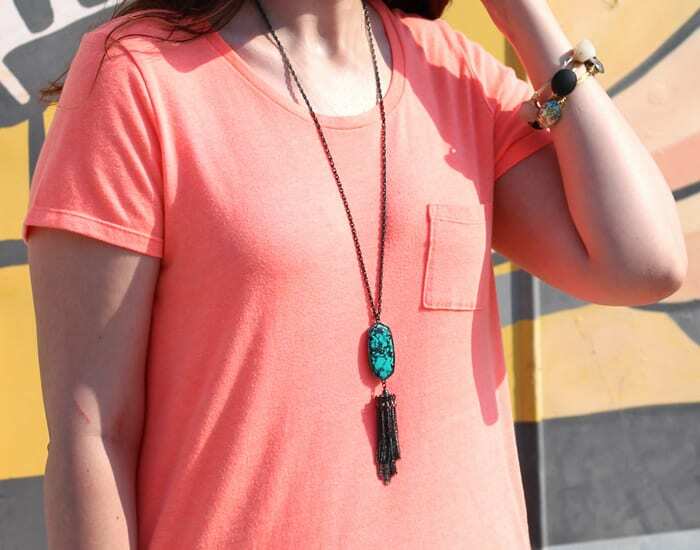 For jewelry, I pair it with my teal magnesite pieces from Kendra Scott. The colors just POP together! 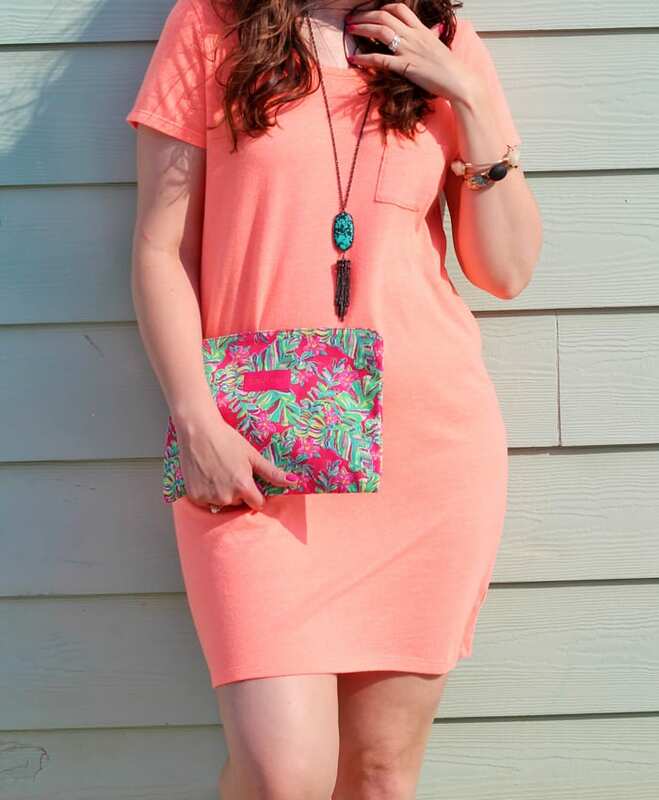 It’s such a fun color combo, and the jewelry really dresses up the simplicity of the dress. I threw on some of my favorite bangles. 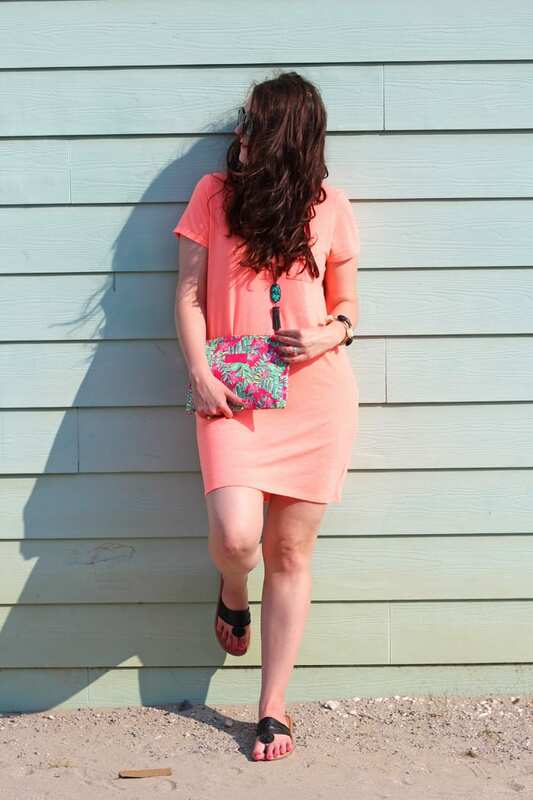 The sandals are actually designer dupe shoes–personally, I prefer the dupes! They’re sooo comfortable and come in four great neutral colors. 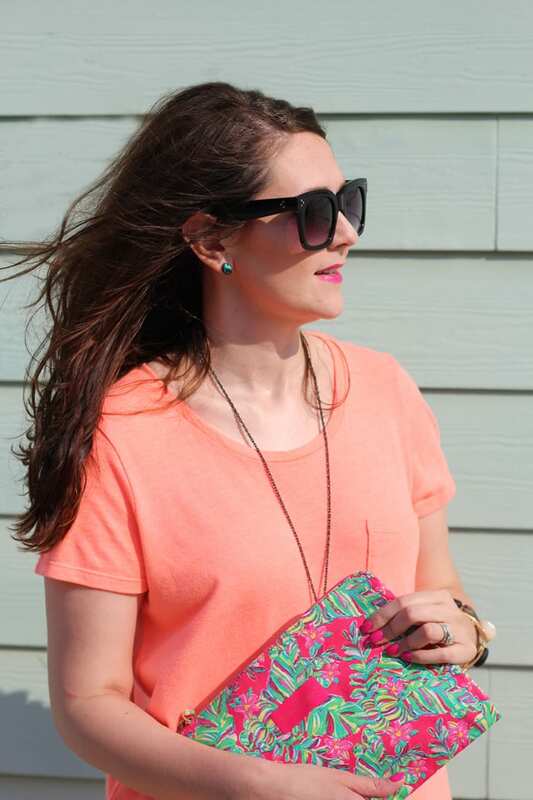 And I rounded my outfit out with this fun Lilly clutch, which pulled everything together. We snapped these pics outside of Rita’s Seaside Grille. It’s located just across the road from Tides Folly Beach. The food is delicious–the burger and fries really hit the spot! We didn’t get to eat here this time around and I was really disappointed. The inside is decorated really cute, and they have an outdoor dining area as well. Rita’s is actually owned by the same company that owns Halls Chophouse in downtown Charleston. Sandals: Shoe Show–comes in 4 colors! 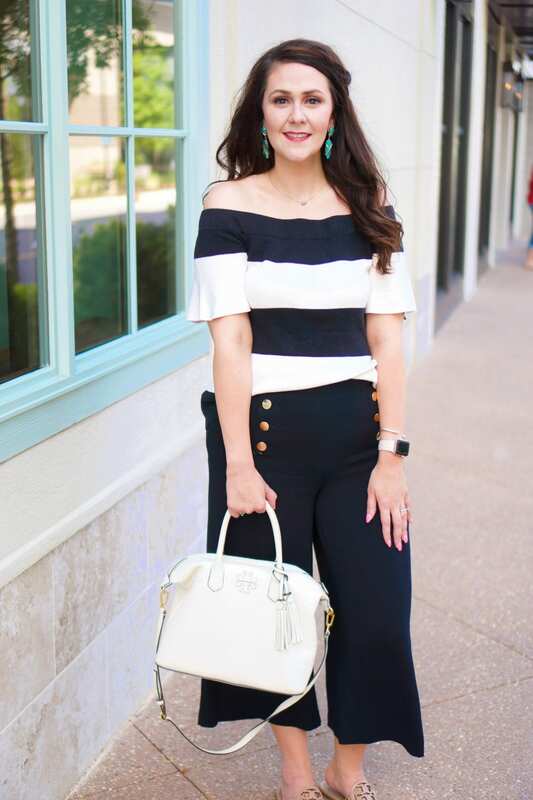 This outfit was perfect to take from the beach to a night out shopping! We hit up the outlets in North Charleston, then came back to have dinner at the Bohemian Bull on Folly Beach (full review to follow! ).